In a major step forward in the battle against macular degeneration, the leading cause of vision loss among the elderly, researchers at the University of Virginia School of Medicine have discovered a critical trigger for the damaging inflammation that ultimately robs millions of their sight. The finding may allow doctors to halt the inflammation early on, potentially saving patients from blindness. 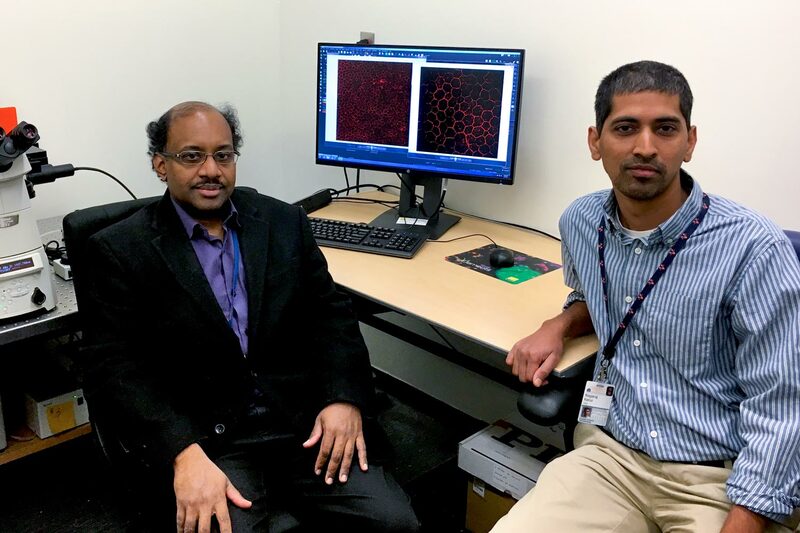 Ambati and Nagaraj Kerur, assistant professor in the Department of Ophthalmology, and their laboratories have determined that the culprit is an enzyme called cGAS. The enzyme plays an important role in the body’s immune response to infections by detecting foreign DNA. But the molecule’s newly identified role in the “dry” form of age-related macular degeneration – which involves no leakage of blood or serum in the eye, and accounts for 85 to 90 percent of all macular degeneration cases – comes as wholly unexpected. The researchers noted that cGAS may be an alarm not just for pathogens, but for other harmful problems that warrant responses from the immune system. The enzyme may also play important roles in conditions such as diabetes, lupus and obesity, and researchers already are working to create drugs that could inhibit its function. The promising new lead comes as good news for researchers seeking to develop new treatments for dry macular degeneration, as clinical trials in recent years have come to dead end after dead end. The UVA researchers expect the development of a drug to inhibit cGAS will take several years, and that drug would then need to go through extensive testing to determine its safety and effectiveness for combating macular degeneration. The researchers also hope to develop a way to detect the levels of the enzyme in patients’ eyes. That would let them determine when best to administer a treatment that blocks cGAS. The findings have been published in the scientific journal Nature Medicine. The research team consisted of Kerur, Shinichi Fukuda, Daipayan Banerjee, Younghee Kim, Dongxu Fu, Ivana Apicella, Akhil Varshney, Reo Yasuma, Benjamin J. Fowler, Elmira Baghdasaryan, Kenneth M. Marion, Xiwen Huang, Tetsuhiro Yasuma, Yoshio Hirano, Vlad Serbulea, Meenakshi Ambati, Vidya L. Ambati, Yuji Kajiwara, Kameshwari Ambati, Shuichiro Hirahara, Ana Bastos-Carvalho, Yuichiro Ogura, Hiroko Terasaki, Tetsuro Oshika, Kyung Bo Kim, David R. Hinton, Norbert Leitinger, John C. Cambier, Joseph D. Buxbaum, M. Cristina Kenney, S. Michal Jazwinski, Hiroshi Nagai, Isao Hara, A. Phillip West, Katherine A. Fitzgerald, SriniVas R. Sadda, Bradley D. Gelfand and Ambati. The work was supported by many funding agencies, including the Director’s Pioneer Award from the National Institutes of Health and grants from the NIH National Eye Institute and the John Templeton Foundation. Ambati is co-founder of iVeena and Inflammasome Therapeutics, companies that develops products to battle macular degeneration and other inflammatory disorders. He, Kerur, Fowler and Kameshwari Ambati also are named as inventors on patent applications related to macular degeneration. Congratulations to Dr. Ambati and Team for what seems to be breakthrough research. Is there a way for a small donor to contribute to future research? Thank you! If you would like to donate, please visit http://healthfoundation.virginia.edu/ways-to-give, click the specific way you would like to make a gift, and check “other.” In the special instructions category, please enter “ophthalmology.” If you want to support a particular project or person, please include that information as well. For more information or to discuss a gift, please call the Director of Development for Ophthalmology at (434) 924-8432 or (800) 297-0102.